I know a lot of people tend to lavish the most photorealistic games for their visuals, but I’ve always leaned in favor of more artistically rich and stylized games when it comes to aesthetics. Sure, every now and again I’m most wowed with a more “realistic” game for the overall year, but usually I go for the more stylized approach. 2015 was no exception. Kirby’s Epic Yarn on the Wii snagged this award from me in 2010, and its spiritual sequel Yoshi’s Wooly World repeats the feat for 2015. Why? Because no other game in 2015 did more with its visuals than Wooly World. 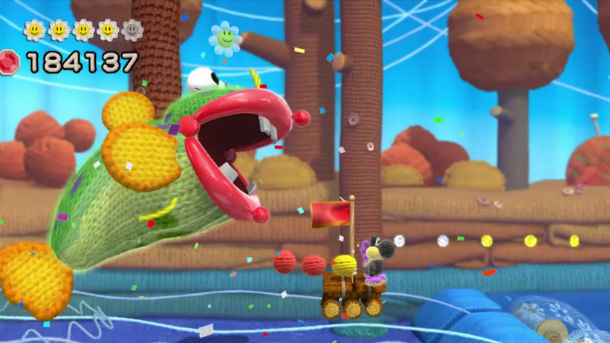 Not only is Yoshi’s Wooly World extremely adorable (without being obnoxious, like Yoshi’s Story), but it cleverly weaved its cloth and fabric aesthetics into its gameplay in fun and unique ways that take the concept to greater heights than Epic Yarn. Everything, from characters to environments to gameplay, benefit from the fabric gimmick. And thanks to the HD capabilities of the Wii U, it all looks absolutely stunning. No other game in 2015 made me smile simply by looking at it. For that, Yoshi’s Wooly World gets Best Visuals of 2015. Hands down. 2 absolutely lovely looking games. Another game I felt was visually gorgeous was Ori and the Blind Forest, which thankfully wasn’t the only good thing about it like it might happen with other indie platformers of the sort.